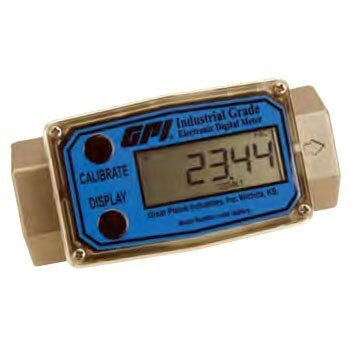 GPI 01A31LM 113255-2 4-Digit, Electronic Digital Fuel Meter is calibrated in liters with 1 inch NPT. 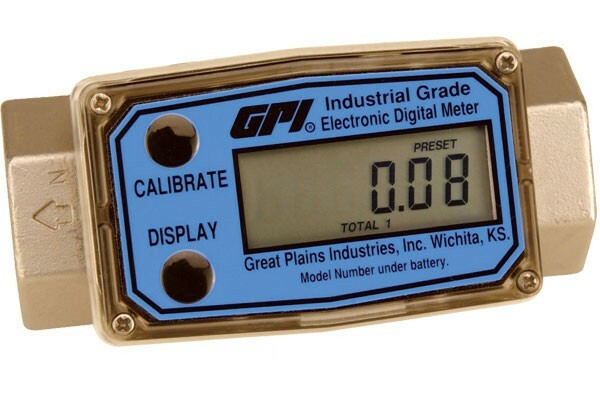 Lightweight and compact with a easy-to-read LCD display. Mounts directly at the nozzle. 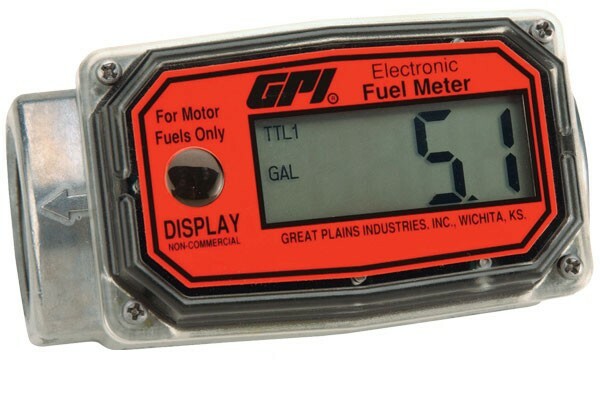 GPI 03A30GM 1139009500 6-Digit, Electronic Digital Fuel Meter calibrates in gallons and liters with 1 inch NPT. 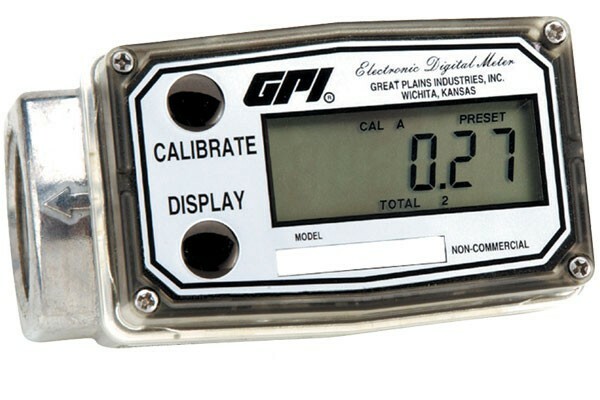 Lightweight and compact with a easy-to-read LCD display. 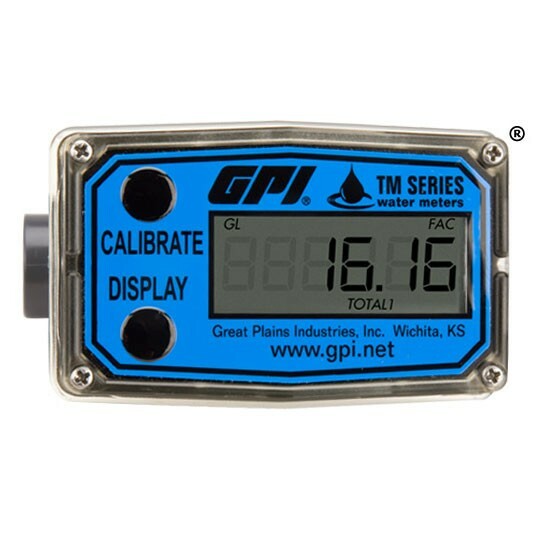 GPI 03A32GM 113900-9502 6-Digit, Electronic Digital Fuel Meter calibrates in gallons and liters with 2 inch NPT. 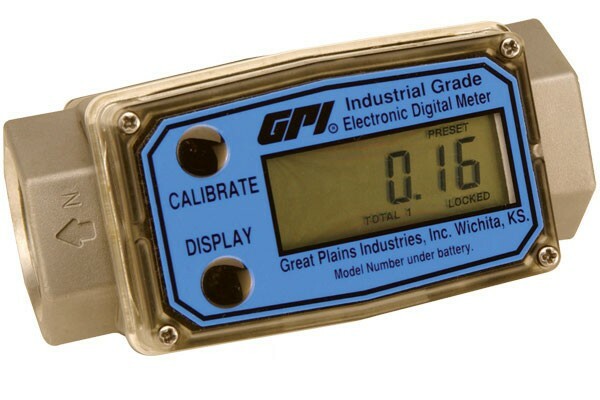 Lightweight and compact with a easy-to-read LCD display. 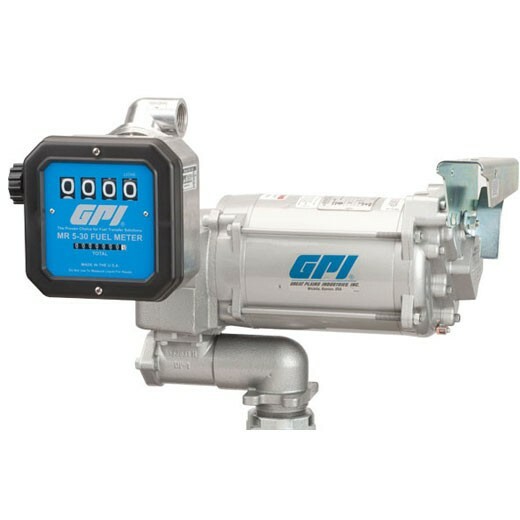 GPI FM-100-G6N 111200-18 4-Wheel, Aluminum Mechanical Fuel Meter with built-in filter is calibrated in gallons with 3/4 inch NPT. Fits virtually all mounting applications. 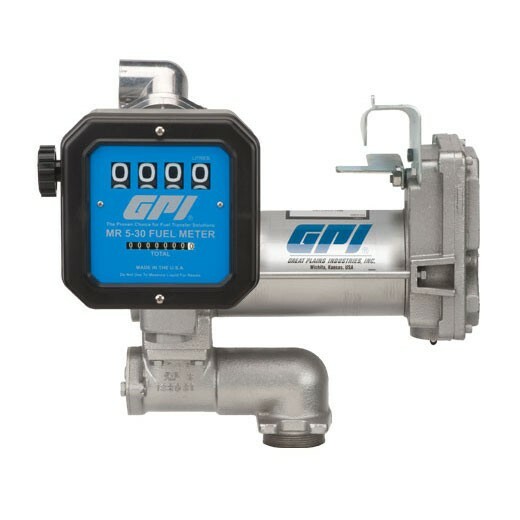 GPI FM-200-G6N 111200-20 Economy 4-Wheel, Aluminum Mechanical Fuel Meter with internal strainer is calibrated in gallons with 3/4 inch NPT. Fits virtually all mounting applications. 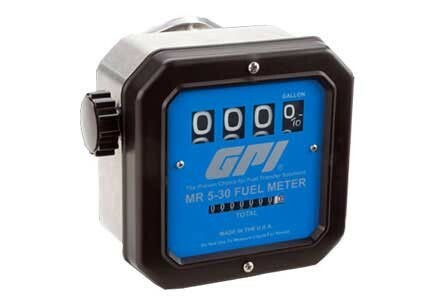 GPI MR-5-30-G6N 126300-01 Aluminum Mechanical Fuel Meter is calibrated in gallons with 3/4 inch NPT. 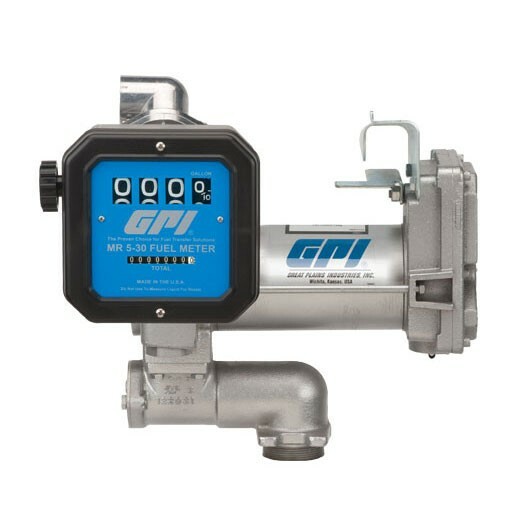 The meter can deliver up to 30 GPM. 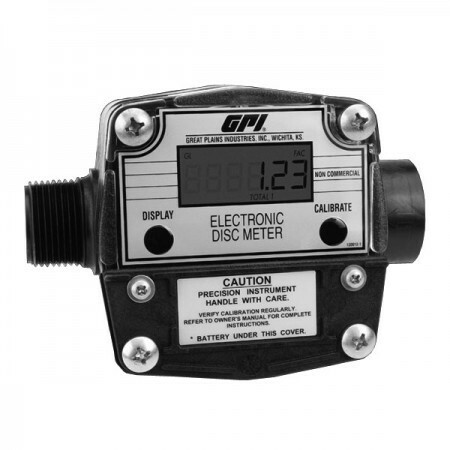 GPI LM-200-Q6N 111316-04 4-Wheel, Economy Mechanical Oil Meter is calibrated in Quarts with 3/4 inch NPT. Factory calibrated for use with hydraulic fluid. 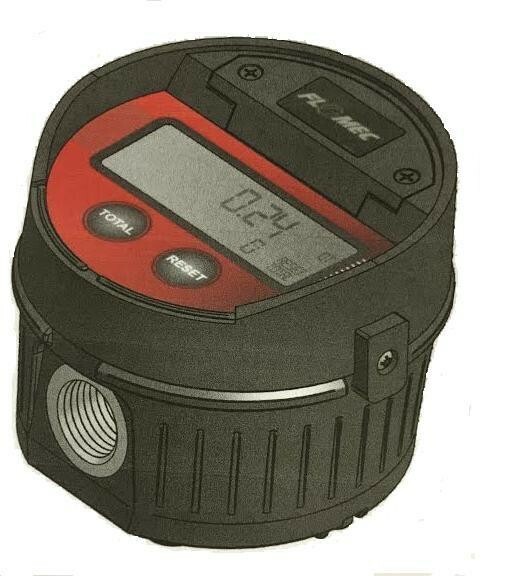 GPI LM-200-Q8N 111316-01 4-Wheel, Economy Mechanical Oil Meter is calibrated in Quarts with 1 inch NPT. Factory calibrated for use with hydraulic fluid. 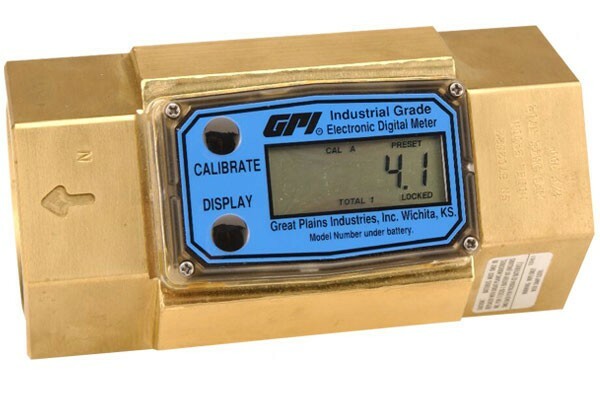 GPI Flomec LM51DN 6-Digit Electronic Lube Meter reads flow rate in gallons or liters and comes standard with 1/2 inch NPT inlet. Perfect for metering oil, gear oils, automatic transmission fluid. 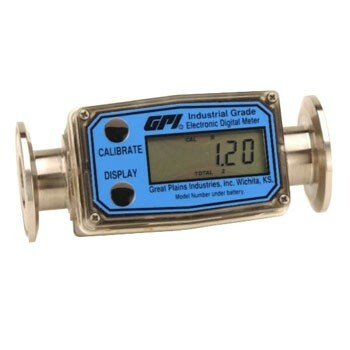 GPI FM-300H-G8N is 1 inch NPT electronic chemical meter. 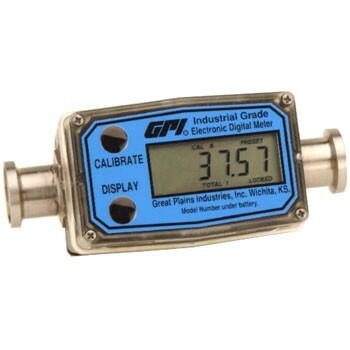 This agricultural chemical meter calibrates in gallons for thin and medium to thick fluids and even oils. 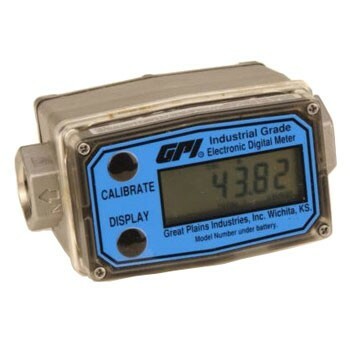 With it's durable PBT polyester construction and nutating disc meter with electronic LCD display, this meter can keep both batch and cumulative totals. 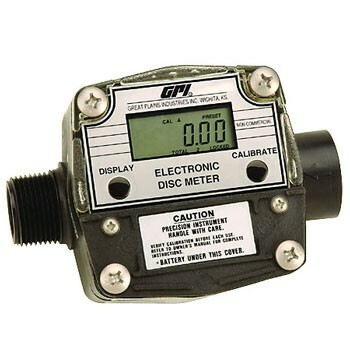 GPI FM-100H-G8N is a 1" NPT mechanical chemical meter. 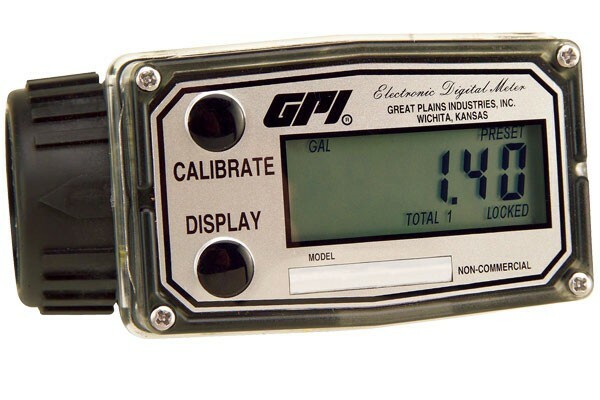 This mechanical herbicide meter calibrates in gallons. 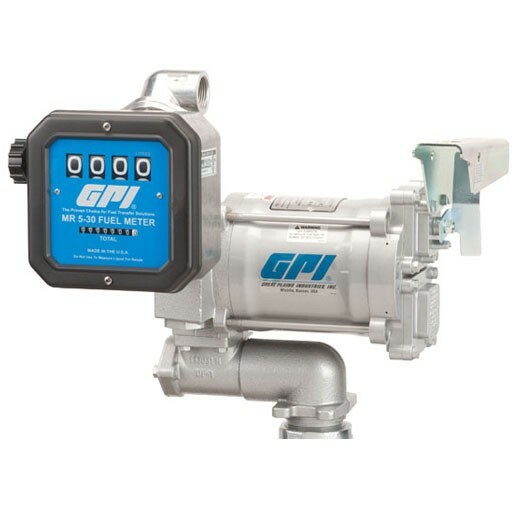 This aluminum housing meter with strainer can handle a flow rate of 4 to 20 GPM (15 to 75 LPM). 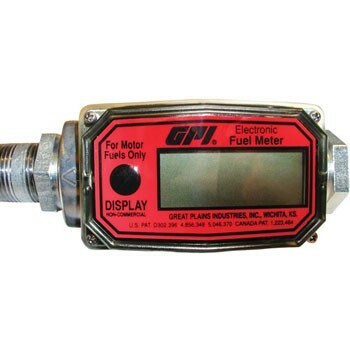 GPI DR 5-30-6N 126300-11 Digital Fuel Meter is calibrated in gallons or litres with 3/4" NPT. 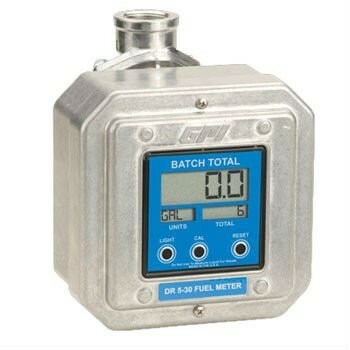 GPI DR 5-30-8N 126300-12 Digital Fuel Meter is calibrated in gallons or litres with 1 inch NPT. 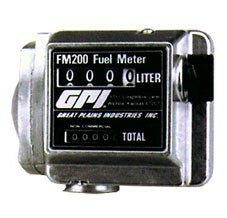 GPI DR 5-30-12N 126300-13 Digital Fuel Meter is calibrated in gallons or litres with 1 1/2" NPT. 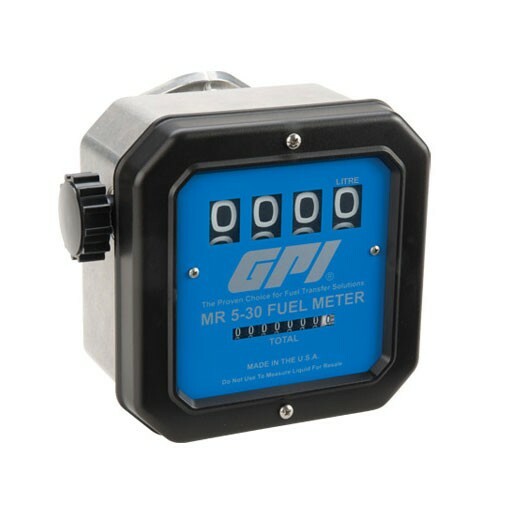 GPI DR 5-30-6B 126300-14 Digital Fuel Meter is calibrated in gallons or litres with 3/4 inch BSPP Fittings. 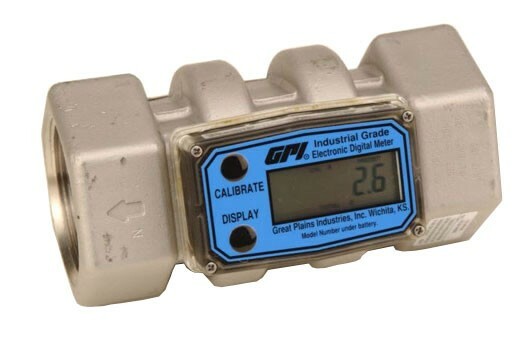 GPI DR 5-30-8B 126300-15 Digital Fuel Meter is calibrated in gallons or litres with 1 inch BSPP Fittings. 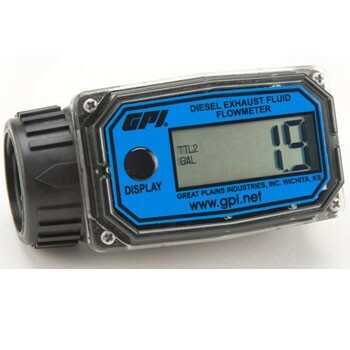 GPI DR 5-30-12B 126300-16 Digital Fuel Meter is calibrated in gallons or litres with 1 1/2 inch BSPP fittings. 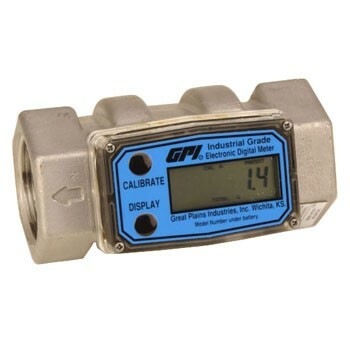 GPI A1 Aluminum Commercial Grade Flow Meter is ideal for measuring fuel diesel, gasoline, petroleum based liquids. Calibrated in gallons and litres with 1" fitting size. It delivers from 0.3 to 3 GPM. 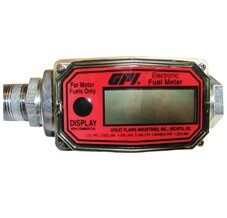 GPI 01A12LM 113255-3 4-Digit, Electronic Digital Fuel Meter is calibrated in liters with 1 inch ISO thread. Lightweight and compact with a easy-to-read LCD display. Mounts directly at the nozzle. 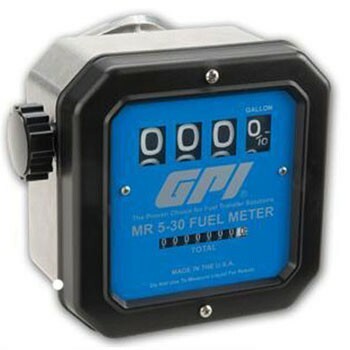 GPI MR-5-30-N 126300-23 Nickel Plated Mechanical Fuel Meter is calibrated in gallons with 1inch NPT. 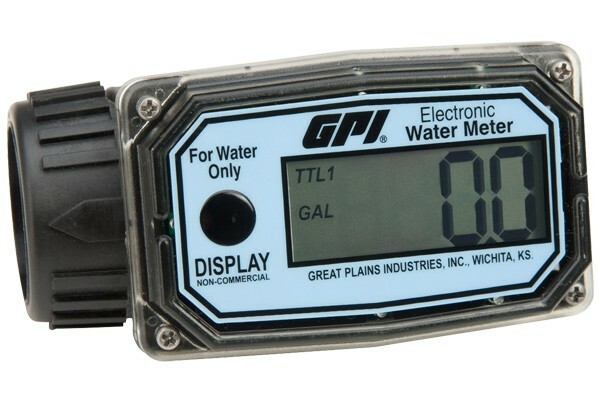 The meter can deliver up to 30 GPM. 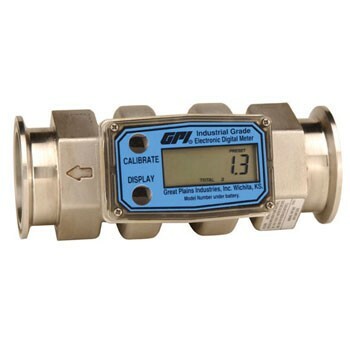 GPI QME05 Energy-Measuring Fixed Ultrasonic Flowmeter comes with QME-F05 ultrasonic transducers for transit time measurement of 0.5 MHz. Oscilloscope function allows graphical display and analysis of signals. Intuitive via 8 main keys (Soft Keys) with a plain text display. 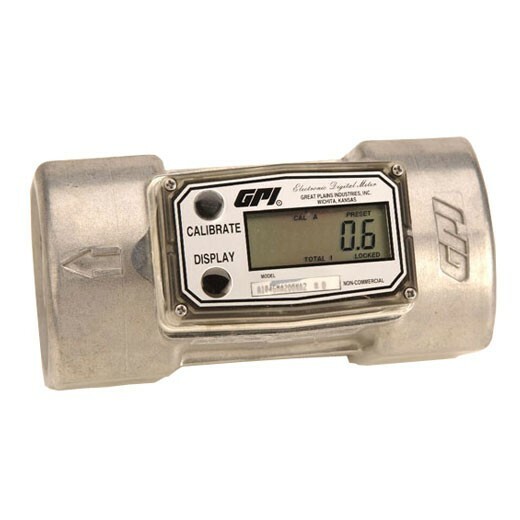 GPI QMP05 Portable Ultrasonic Flowmeter comes with QMP-F05 ultrasonic transducers for transit time measurement of 0.5 MHz. Oscilloscope function allows graphical display and analysis of signals. Intuitive via 8 main keys (Soft Keys) with a plain text display. 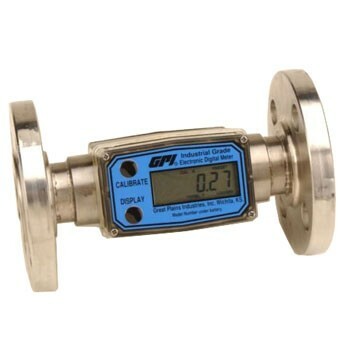 GPI QMF05 Fixed Ultrasonic Flowmeter comes with QMF-F05 ultrasonic transducers for transit time measurement of 0.5 MHz. Oscilloscope function allows graphical display and analysis of signals. Intuitive via 8 main keys (Soft Keys) with a plain text display. 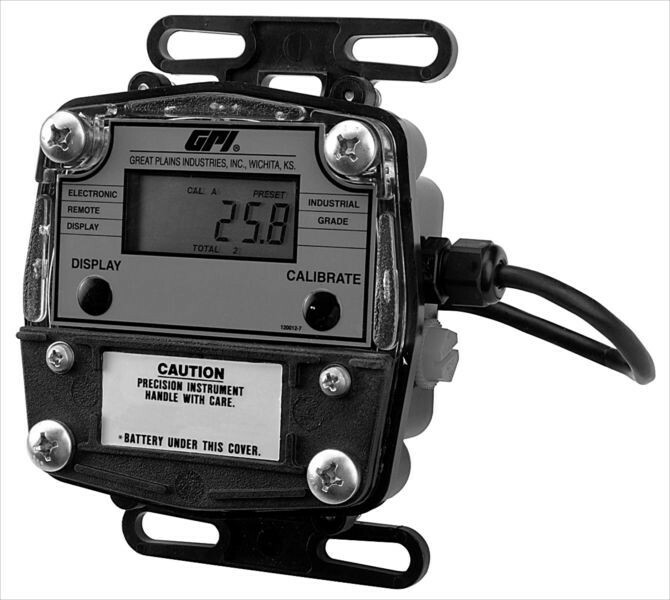 GPI FM-300H-L8N is 1 inch NPT electronic chemical meter. 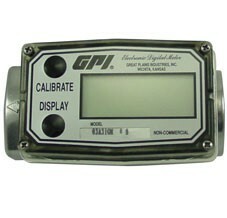 This agricultural chemical meter calibrates in liters for thin and medium to thick fluids and even oils. 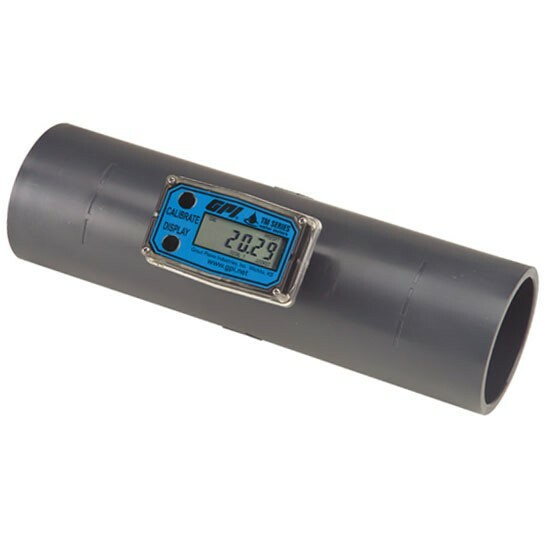 With it's durable PBT polyester construction and nutating disc meter with electronic LCD display, this meter can keep both batch and cumulative totals.